Happy Monday everyone! well - we survived Hurricane Irene - suffering torrential rain, strong winds and many tree limbs on the ground. We also lost cable - so no TV, internet (gasp!) or phone (luckily my cell phone was working!) As of this morning the cable was still out so I hope they've fixed it by the time I get home from work tonight!! I've got cards to post don't you know?!?!? I am very thankful that we didn't lose electricity like many people along Irene's path did. And no flooding - thank you, God. Speaking of cards - I've got one to share that I made for the Inspiration challenge over at Split Coast on Saturday - before I lost my connection!! First I stamped sections of the cracked panel background stamp in Faded Jeans ink - along the top left and the bottom right (isn't it a cool stamp??!) 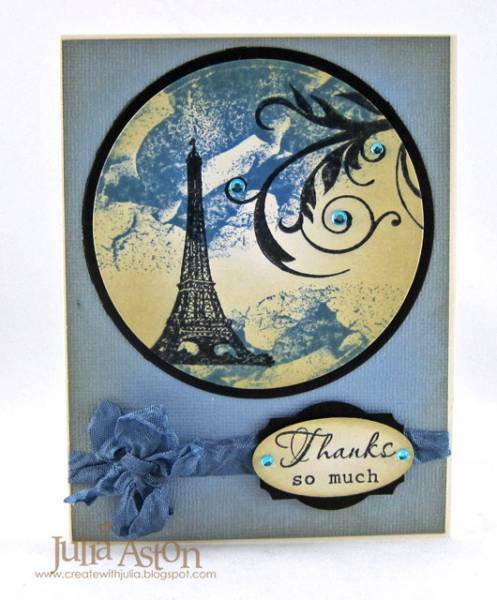 - then I stamped the flourish and finally the Eiffel Tower in black over the background stamping. I inked the edges of the circle with Old Paper. 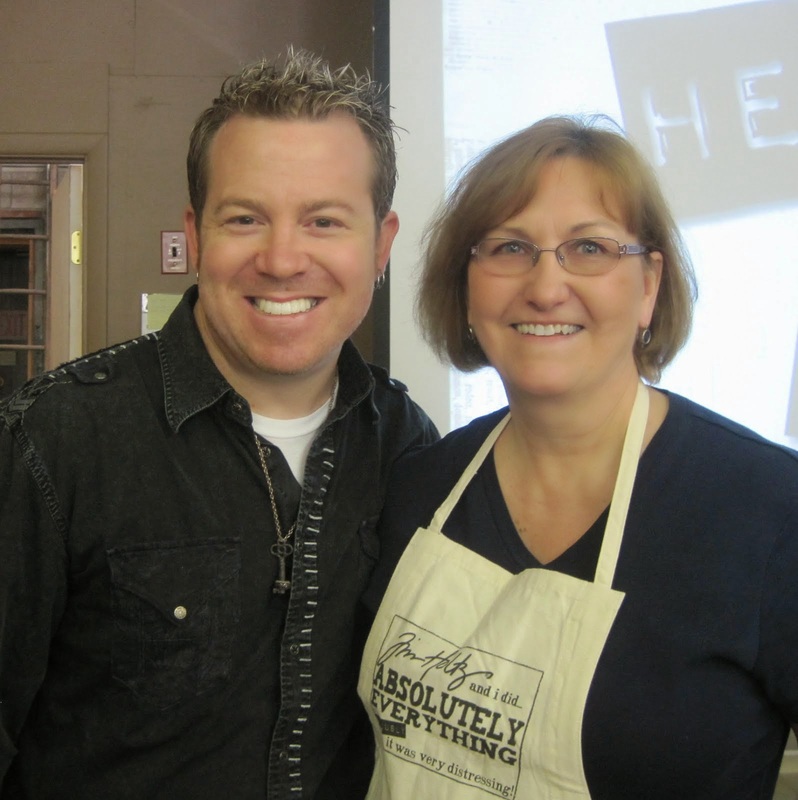 Thanks so much for stopping by - and I appreciate all your thoughts and prayers coming my way over the past weekend! God is good - all the time! Happy Saturday everyone! We're just sitting here in Eastern Massachusetts waiting to see where Hurricane Irene is going to hit us....we put all the outside furniture and garden decorations away and have the flashlights ready! I'm hosting today's post over at the Sweet 'n Sassy blog and I'm showing my fun origami fold card. Here's how it looks totally opened up. My cupcake Rhubarb and sentiment are digital images. 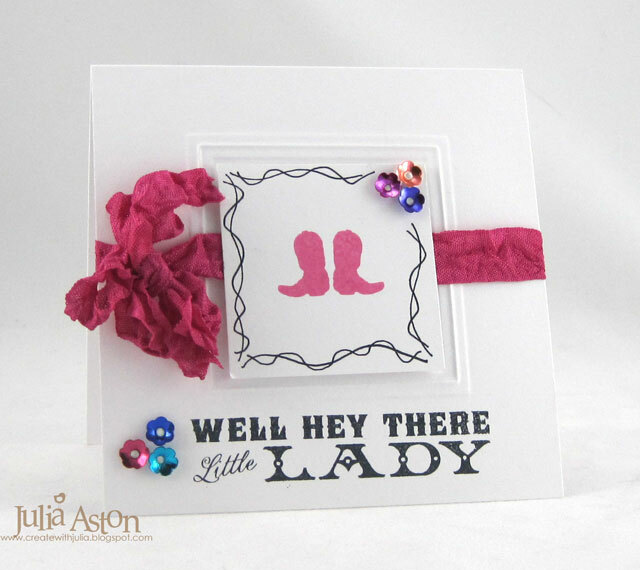 It's fun to create an elaborate shaped card sometimes - for that special person or occasion - and this one is really easy! I hope you'll check it out at the Sweet 'n Sassy Blog! You'll find another pic of my card and a link to the tutorial! Gotta go and get my raincoat out!! Rubbernecker Sale! and Three RN cards! This sale will run from Tuesday 8/23 noon until Thursday 8/25 5 PM. (California time!) The sale will be limited to stock on hand at our distributor. For best selection, place your orders early. No backorders or rainchecks will be offered. We will place the order for the material on Friday and will advise customers of unavailable merchandise and issue refunds on Friday 8/26 if necessary. Materials will be received by and shipped Saturday 9/3. This sale will not be combined with the stamp sale. This sale will run from Friday 8/26 noon through Sunday 8/28 5 PM. (California time) It will include all items in each of our stamp lines and our free stamp program (Shoppers Rewards) WILL be in effect, so remember to incude your free choices with your order. If you have any questions about the program, rules are posted on the home page of the site. This sale will not be combined with the Spellbinders sale. And just to give you some samples of the stamps you can buy - here are 3 cards I've made for challenges over on Split Coast this past week using Rubbernecker stamps! Back to Primary Color School! I decided to make a little note/photo book using my challenge colors. 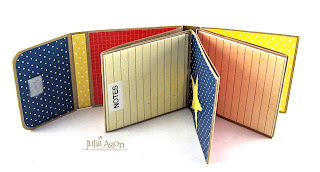 I found the pattern for this cute little Mini Fold Book on Lisa Johnson's blog here. 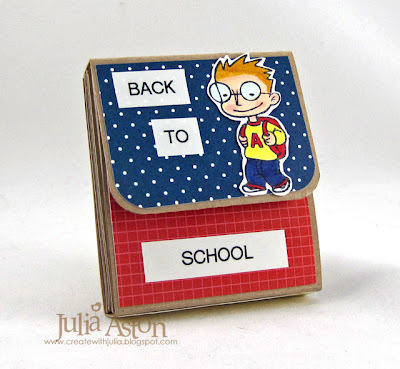 Alex from Rubbernecker is all set for getting back to school this fall. I colored him with Copics, cut him out and adhered him on the front flap. I used velcro to hold the flap closed. Here are some views of the inside pages. I used my P-Touch Label maker for all the words - a great way to get the exact words you want and have them be all matchy/matchy! What would you use a little book like this for?? 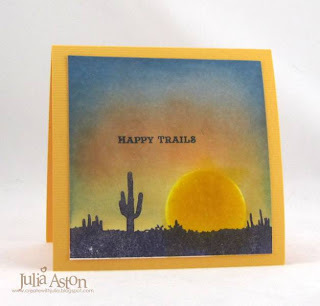 I recently participated in a Rodeo theme virtual stamping night over at Split Coast and I never got the cards posted here on my blog - so I thought I'd share them now. There are 6 in all - so you may want to grab a cup of coffee or tea and settle in!! 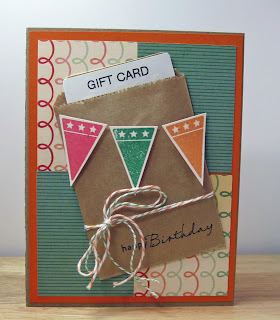 The challenge for this card was to use flags or pennants and red/white/blue. I embossed the square Nestability on my card. Then I stamped the cowboy, the mountain and desert background on a panel sponged the edges and adhered it inside the frame. I sponged the edges of the card and the frame. I stamped the banners and cut them with Nested Lacey Pennants. I attached twine to the back of them and adhered them to the card with foam tape. I was stumped for a bit - then remembered this fun set by Waltzingmouse that includes arms that are waving!! I added the guitar to his waving hand to bring in the Western connection! I drew the street line with a micron pen to ground the scene and sponged the edges with Antique Linen. I think you can see all the bright colors I used - and I actually had a clown stamp from Rubbernecker to use on my card!. The sentiment is from Waltzingmouse. I popped up the clown on foam tape and the rhinestones kind of pop up being gems and all - right?!! 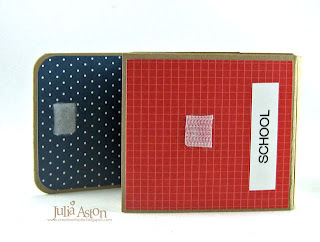 The 4th challenge was to use sequins on your card. I had these sweet little flower sequins in my drawer - this is the first time I've ever used them! I've had them forever and almost threw them out the last time I was attempting to clean up my craft room! My stamps are from Waltzingmouse. I embossed a square Nestability on my card, tied a wrinkled seam tape ribbon around the card - then stamped the boots on a panel, drew the squiggle lines and adhered it inside the frame popped up on foam tape. I stamped the sentiment under the frame and added the flower sequins with quick dry adhesive. Challenge #5 was to brayer a sunset. And for the 6th and final challenge (phew!) 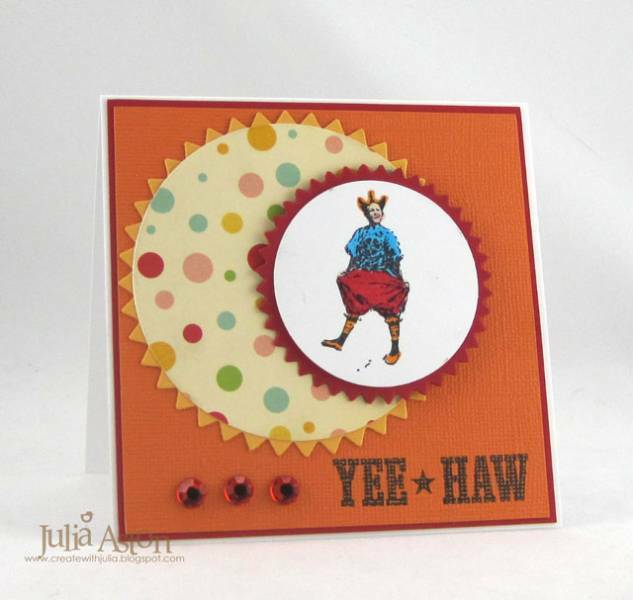 our card had to be inspired by the words in the song Wild Wild West by Escape Club AND to use gingham. I was inspired by the line "love her eyes and her wild wild hair"
I bought this fun stamp by Art Gone Wild several years ago and I've never used it (!) but I knew I had it - so first - I had to find it! Her wild hair sure fits - but we cannot tell about her eyes since they are covered with 'shades'! I colored her with Copics and cut it out around the edges. I stamped the blanket background and sentiment with stamps from Waltzingmouse. I tied two ribbons around the card - one gingham and one wrinkled seam tape then layered the image over them with foam tape. I added orange rhinestones around the sentiment and yellow Stickles on the flames of the birthday candles all for a little sparkle! So there you have it - thanks for sticking with me through this long post! It was one wild night of stamping let me tell you - you had to make each challenge card in 45 minutes or less (scout's honor!) nothing like stress to get your creative juices going!! The weekend's almost here - whoo hoo!!! Kent and I plan on getting the kayaks out and paddling around a local lake tomorrow. 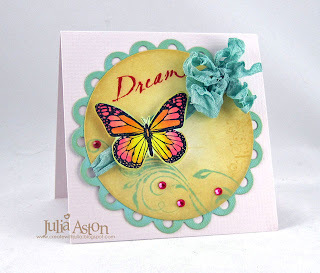 Just had to share today - Have you checked out these two brand new issues from PaperCrafts yet? If you look at page 119 of Card Ideas you'll see this banner birthday card I made. You'll also find cards by some of my DT pals - Belinda Chang Langner, Kelly Schirmer, Tosh Leyendecker & Jen Cuthbertson! 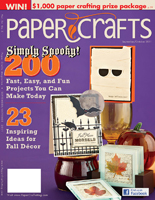 And if you look at page 36 of this PaperCrafts Simply Spooky! My DT pals - Jen Cuthbertson and Sarah Martina Parker are also in this issue! 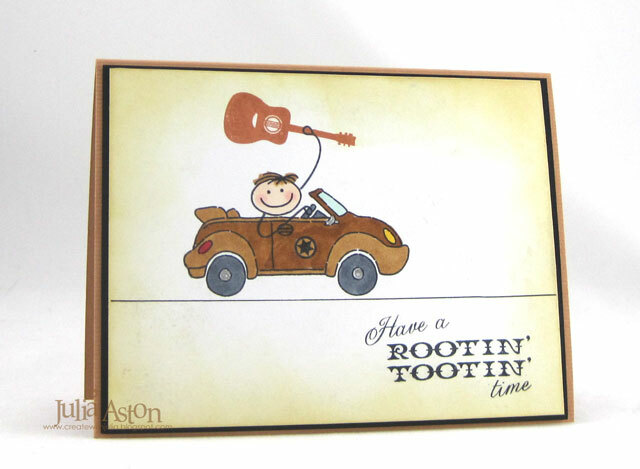 Thanks for indulging me tooting my own horn today - it's such a thrill to see your cards in print! Other: (2 1/2" x 4" mini brown bag) Michaels. 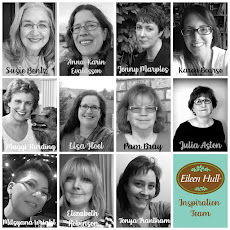 Friends of Waltzingmouse Forum Blog Hop - There's Always Time for You! 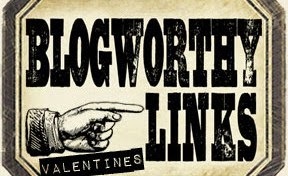 Today I'm participating in the Friends of Waltzingmouse Blog Waltz taking place in the WMS forum. The theme this month is tea/coffee! Check it out here in the Playroom of the Forum. Today the WMS Design Team is also taking a moment to honor and thank two of our members who are leaving the team - Bonnie and Carly. We will sorely miss you two lovely ladies - Bonnie with your quick wit and Carly with your wonderful and creative CAS designs. I made this sweet little purse in honor of you, dear Bonnie and Carly! My friends - there's always time for you! 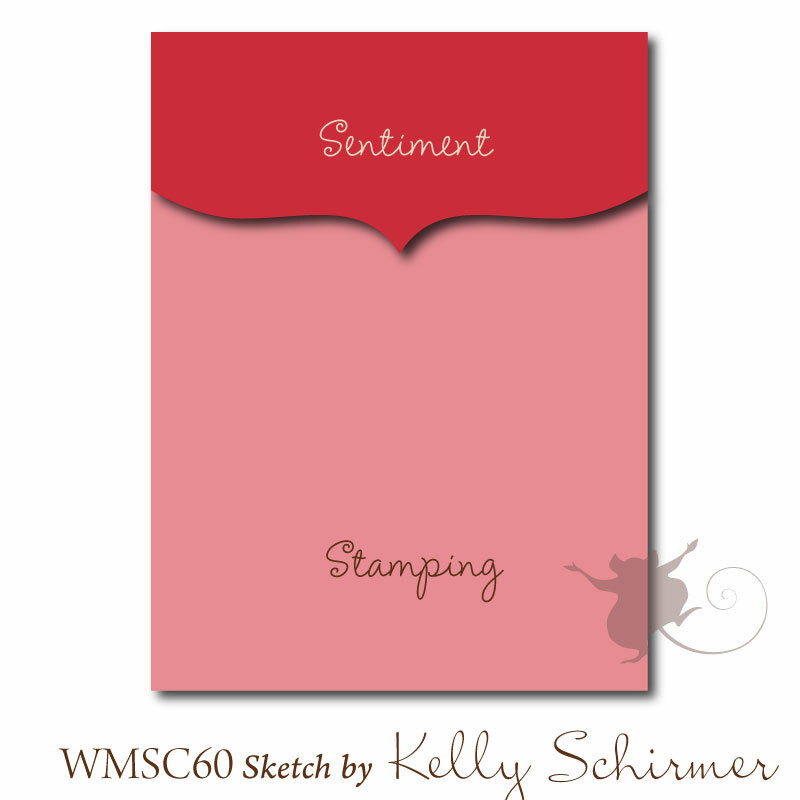 My stamps are from Afternoon Tea Sentiments. 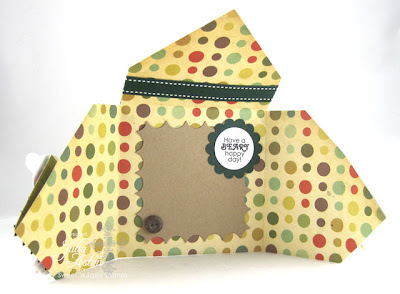 I found the link to this sweet little purse template on Dana's blog here. The template was made by Mary Fish. I cut out my purse from a piece of patterned paper. I used twill for the handle and held the flap of the purse closed with a piece of velcro. Now I'm off to the WMS forum to blog waltz and see all the fun tea/coffee card inspiration! Are you coming? Accessories: brads - Making Memories, flower die - MFT, felt - Michaels, dark chocolate twill - PTI, Scor Tape, foam tape, petite oval Nestabilities, Fancy Tags 3 Spellbinders, velcro & tiny tag - Staples, gold rhinestones - Michaels. 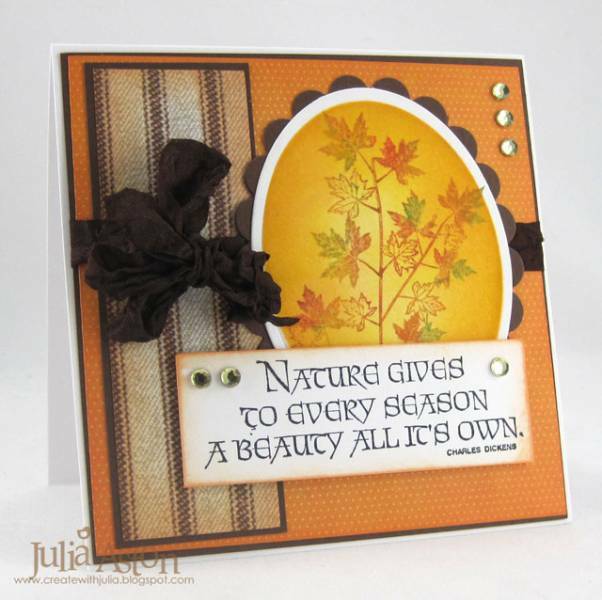 I'm thrilled to be Sweet Peeking a wonderful new stamp set today designed for SNSS by the uber talented Dina Kawal called Season of Change! My panel of leaves is stamped on watercolor paper and layered behind the front panel (also watercolor paper it has such a nice texture!) - framed by a cut out of a Mega Rectangle Nestability. I popped the front panel up on foam tape to give it depth. I used the same rectangle to emboss the frame on the right where I stamped this wonderful quote. I layered the the panel to green and then burgandy panels, added the rhinestones and tied the wrinkled seam tape around it tying it in a double bow. 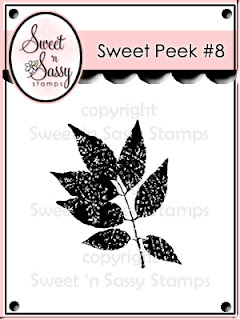 I hope you'll hop over to the Sweet 'n Sassy blog to find the links to Mary and Janette - the other Design Team members Sweet Peeking this wonderful leaf set today! All of the new sets will be available for purchase on Aug 16th! (that's tomorrow guys!!) Be sure to check it out! More big news!!! - Sweet 'n Sassy stamps has also just become a Split Coast Stampers associated company. I hope you can come to the release party tonight at SCS. We will be in this forum showing the full reveals of all the new sets, a few challenges and there are prizes to be won. Hope you can join us from 8:00-10:00 EST pm tonight. It should be a fun night! Accessories: Mega Rectangle Nestabilities, foam tape, rhinestones - Kaiser, wrinkled seam tape - Prairie Bird Boutique Etsy Shop. Welcome to our little HOP!! We are SO happy that you could join us in celebrating some NEW stamps! Mr. Rubbernecker released some SUPER cute images, on the down low, a few weeks back and we wanted to share them with you!! They are SO adorable that we just HAD to show them off! We have sweet SCOOTER KIDS, some new ANIMALS, and we even got some cute new FRIENDS!!! 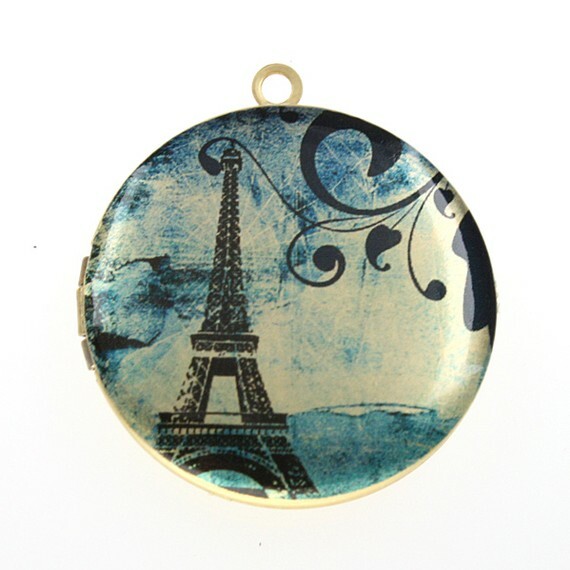 You can find them by visiting RUBBERNECKER STAMPS and clicking on the 2011 NEW RELEASES!! Hey, wait, there is MORE!! We also have something else to CELEBRATE!!! Our design team has a NEW name!! We are SO excited!! I bet you were wondering what was up with that!! Weren’t you?! We are NOW the……………………………..
WOW, more coolness!! Our winner will be announced on TUESDAY, so you will have plenty of time to hop! OK, better get HOPPIN’!! 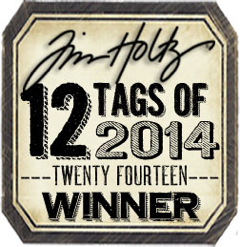 Thanks SO much for being a part of our excitement!! You will find the HOP ROUTE and my creation below!! Have an AWESOME day!!! Now that you have all the deets from DT Coordinator Jacquie - Here is my card! I used two of the Scooter kids on my card today - Alex and Audrey - and they're off for their first day at school! Their back packs are filled with paper, pencils, rulers and crayons! I did a little hand stitching on the side of my card - piercing holes and stitching with some bakers twine. I even put a little sequin flower on Audrey's headband! 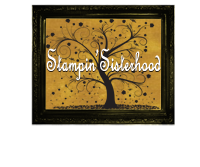 Now off you go to my fellow Stampin' Sisterhood blogs to see what stamps they're playing with today! Accessories: glue dots, foam tape, paper piercer, twine - PTI, Rhinestones - Kaiser, Pencil Sticker - EK Success, Copics - R20, R37, RV02, BG10, B45, E00, E13, E33, YG95, Pinking circle and circle Nestabilities, flower sequin - Cartwrights. 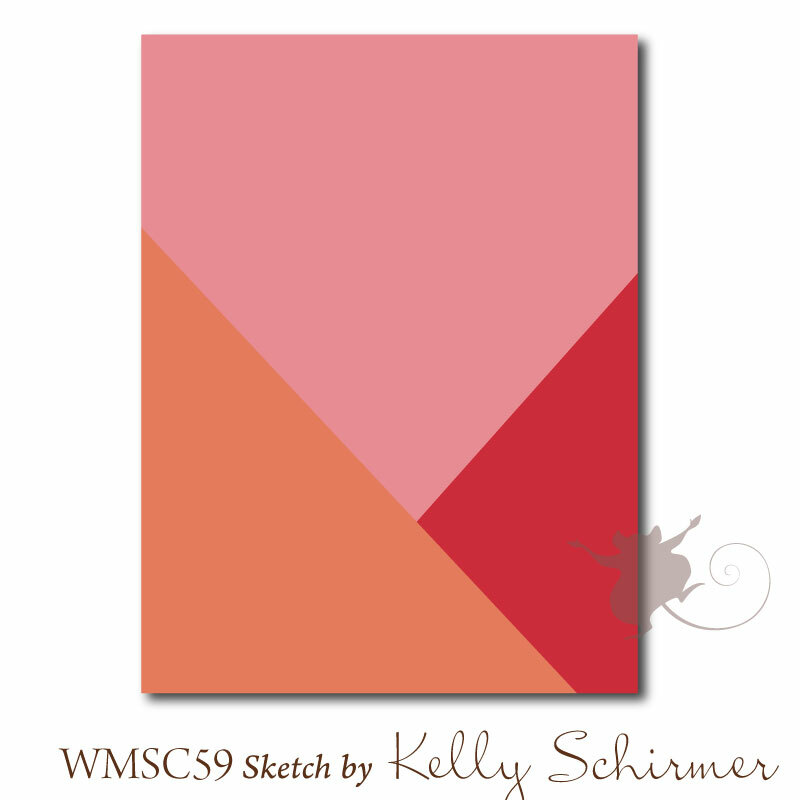 To see my WMS Saturday sketch card - please scroll down to the post below. I know you've seen lots of Korin's sweet little bear, Rhubarb on cards everywhere, as a digital image - and now he's in the flesh - well in clear acrylic anyway!! This fun little set includes 3 fall Rhubarbs and 6 wonderful sentiments to go along with him. 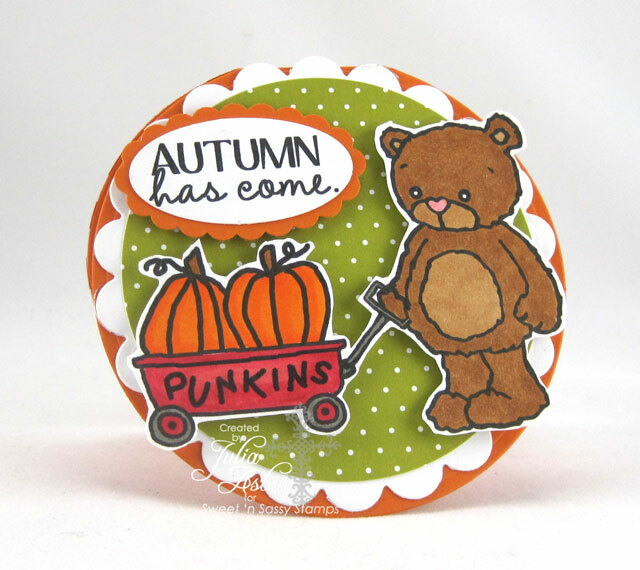 Today I made a round card to show off Rhubarb totting around his two 'punkins' in his little red wagon! I used circle and scallop circle Nestabilities for my card. I colored Rhubarb and his wagon with Copics, cut around the edges and adhered it to my card with foam tape. I punched the sentiment and scallop oval and layered them with foam tape too so everything is popped up. 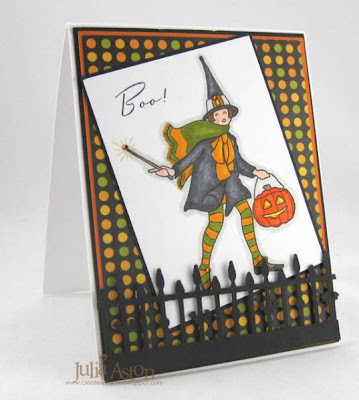 Isn't this a fun little fall card?! Now it's time to hop over to the Sweet 'n Sassy Blog to find the links to Lorie's and Cathy's cards using this sweet Rhubarb set! It's been quite a Sweet 'n Sassy week! I'll be back on Monday with another sweet peek - hope you'll stop by to see! Accessories: Foam tape, large oval and scallop punch - SU, circle & scallop circle Nestabilities, Copics: E39, E35, E37, R29, R32, W6, YR04, YR07. Saturday Waltzingmouse Sketch - Halloween Greetings!! Another wonderful sketch design by Mischief Maker Kelly today! You could go all kinds of ways with this don't you think??!! I'm definitely in the Halloween mode with the release of Claire's wonderful new sets Cicely at Halloween and Gracie at Halloween. 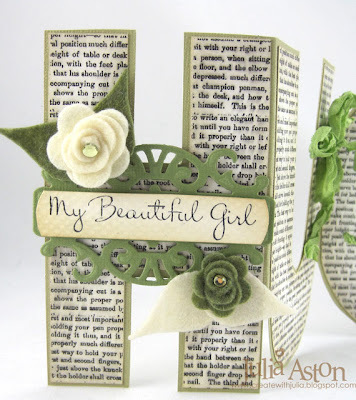 Today I used stamps from the Cicely Set - the sentiment, the bats and the little poem! 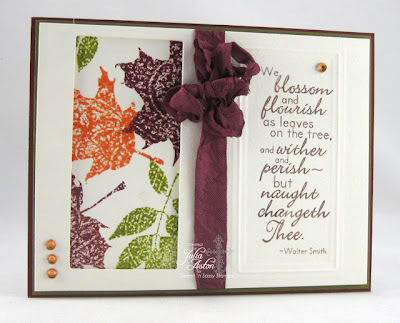 I embossed the top sentiments with Ranger Distress Antique Linen Embossing Powder and embossed the poem with black. I sponged the poem after die cutting it but before taking it out of the die. Kent and I are spending the day at Merry Meeting Lake in New Durham, NH with a lot of his cousins - an annual event - hopefully we're enjoying the sun and the beautiful lake! Accessories: foam tape, rectangle Nestability, Black embossing powder, Antique Linen Distress Embossing Powder - Ranger, Tiny Twinkles - Taylored Expressions, drippy punch - Martha Stewart, Wrinkled seam tape - Prairie Bird Boutique Etsy Shop, lemondrop bakers twine - the Twinery. 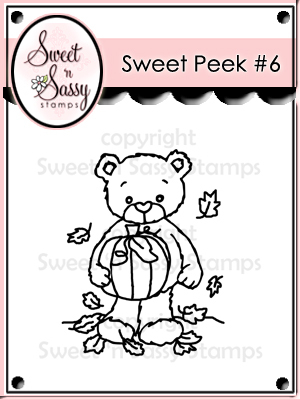 Welcome to Sweet Peek Day #5 of the Sweet 'n Sassy August 16th release! 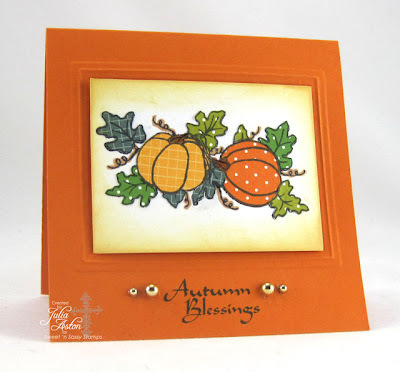 Korin's stamps this month are all about the coming fall season - can you smell the crisp fallen leaves and feel the thrill of finding that perfect pumpkin in the patch?! I paper pieced all the parts of this wonderful image - the two pumpkins, and all the leaves. I love how you can bring texture to an image using figured patterned papers! And if you're not big on coloring - this is a great way to get it done! Here I used papers with dots and grid patterns. First I stamped the image on a white panel. I colored the pumpkin stems and scrollies with brown Copics. Then I stamped the different pumpkins and leaves on scraps of my patterend papers, cutting out each piece and adhering it over the white stamped image with a glue pen. I sponged the edges and adhered the panel inside an embossed rectangle Nestability with foam tape. 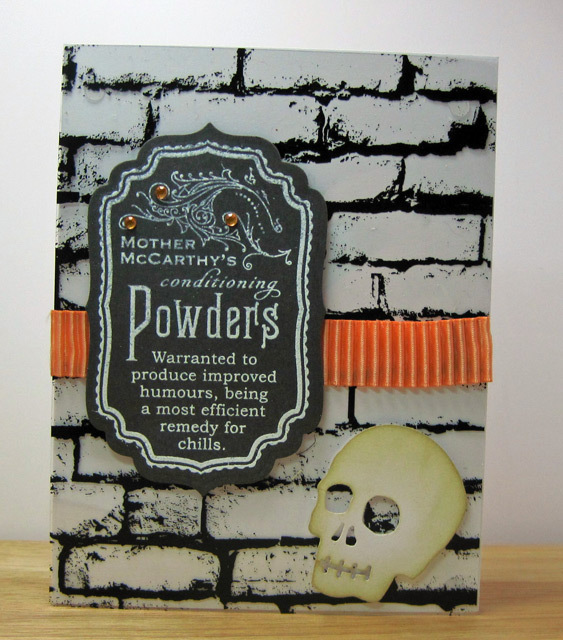 I kept the card clean and simple to accent the wonderful pumpkin patch! I stamped the sentiment directly on the card base and adhered gold rhinestones on either side. Please hop on over to the Sweet 'n Sassy Blog to find links to fellow DT members, Neva and Cindy who are also sweet peeking this lovely set today! Ahoy Matey - A Witch and a Pirate Ship! 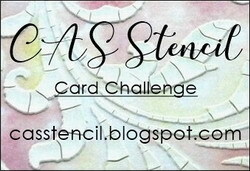 I have two cards to share with you today - both made for Split Coast Stampers Challenges, and both made with Waltzingmouse Stamps. First up is a Halloween card I made for this week's featured stamper - I cased this fun 'boo' card of DaisyFreak's. The stamps are from one of Claire's newly released sets - Cicely at Halloween. I colored Cicely to coordinate with the fun dots patterned paper behind her and I got to use my fun Martha Stewart Halloween fence punch that I bought last year dirt cheap at the end of the season! There are little bats on the centers of the longer posts that you can't see to well on this pic. I added a little bling to the front of her ankles, hat buckle and wand tip! 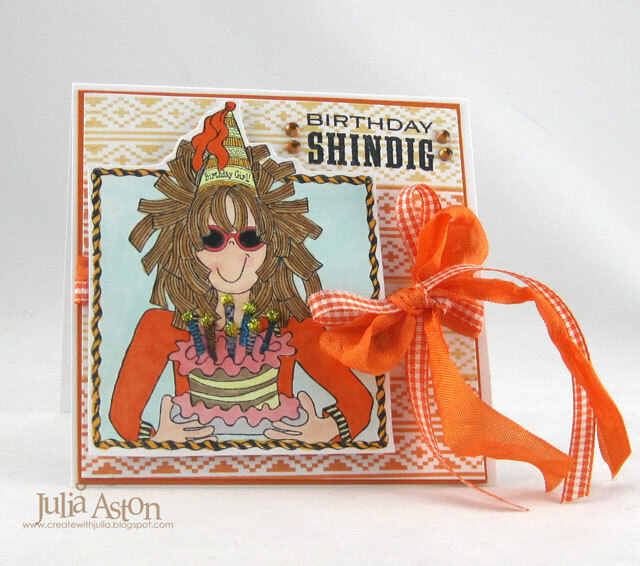 My second card was made for the Inspiration Challenge which was the web site Modern Lola. 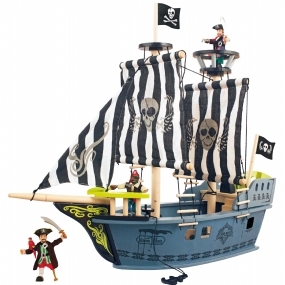 I was inspired by this fun pirate ship. And here's the card I created. I used a Disney Pirate Ship die from Provo Craft. Die cutting it once in blue and once in white. Then I cut the white sail section (they're all connected) off the white die cut, colored black stripes on the sails and colored the poles brown and adhered them over the blue die cut with foam tape. That's it from me today! Thanks so much for stopping by! I'm sort of skipping right past summer with my cards today - or forgetting totally what season we are currently in!! LOL!!! I made these cards as part of the Dare to Get Dirty challenges marathon last week - we had 35 challenges in all!! Were you playing along too???!!! This is the first time I ever tried paper pleating and I love the look! I took a piece of Coredinations green paper - 12" x 3/4" - and scored it at 3/4", 1", 3/4", 1" repeating to the end of the 12 inches. Then I folded it on the score lines and it just fit this 5 1/2" card! I put a piece of Scor Tape along the back to hold the pleats and to adhere it to the card. I did have to put a glue dot under the first pleat on the left to hold it down. You could also stitch across the pleats but my sewing machine isn't cooperating lately so I didn't go there!!! 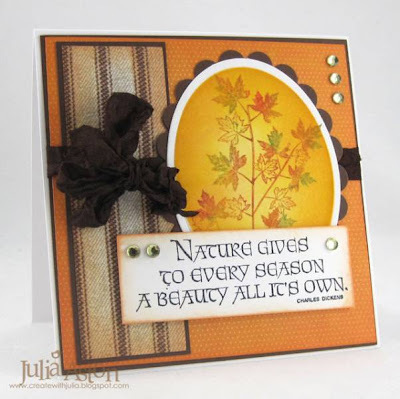 I used 4 colors of Memento Dew Drop Inks to ink the leaves so they looked like fall. Then I cut the white panel with an oval Nestability and inked the panel with Mustard Seed and Dried Marigold Distress Inks before taking it out of the die. Then I layered it to a scallop oval Nestability. 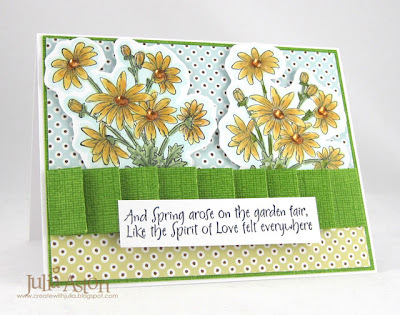 I inked the edges of the patterned papers with the Dried Marigold also. I added rhinestones to the sentiment and corner. Don't you love that font on this sentiment??!! So there we go - from one season to the next! It's the last Saturday of my vacation (boo hoo!!) but on the bright side - there's another WMS Sketch for us to play with! Mischief Maker Kelly was the designer again this week! Whoo hoo Kelly! Here's her fabulous sketch! This could be easy or this could be difficult!! - which is it for you??!! I interpreted it pretty literally today and I made it a Christmas card with a paper flower on it for two of the Dare to Get Dirty Challenges going on over at Split Coast this week! I actually love how this came out with all the blues and touches of white that I used. The pretty die cut lacey edges are from something I won from Paper Crafts Magazine last year - they come already precut in 6 inch lengths by Bazzill Basic Papers! They are different from each other but kind of matchey matchey don't you think?! I used stamps from several WMS stamp sets on my card - the star and sentiment are from Seasons of Love, the dotted background is from Off Beat Backgrounds, the flower grid background is from Pic-Nic Patterns and the music background (behind the heart - see it?!) is from Musical Backgrounds. I stamped the heart on white card stock, cut it with a Heart Nestability sponged it with Weathered Wood before taking it out of the die then layered it to a piece of blue card stock die cut with a scallop heart Nestability. I also sponged the edges of all the panels with Weathered Wood. I didn't tape down the inside edges of the angled panels so it creates a pocket that I slipped the heart into - the receiver can remove it and use it as an ornament or decoration if they choose. We also have an exciting announcement this week! We have two wonderful new Mischief Makers for the sketch challenges - two very talented and creative ladies - please welcome Iwona Palamountain and Kim Duran! You can check out all this week's sketch challenge information over at the Waltzingmouse Sketch Blog , and please join along in making a card. 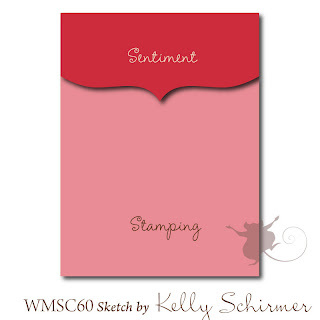 You could win a free WMS stamp set or be chosen as a Top Mouse for the week!! 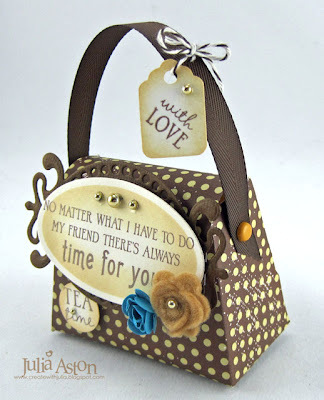 Accessories: sticky pearls - Michaels, wrinkled seam tape - Prairie Bird Boutique Etsy Shop, Die cut lacey edges - Bazzill Basics Papers, glue dots, Scotch Quick Dry adhesive, flower die - MFT, Heart and scallop heart Nestabilities, cropadile. Waltzingmouse August SOAP - Day 4 - Rewind to Afternoon Tea! Welcome to the last day of the Waltzingmouse August Stamp of Approval Parade - today all of the Design Team is parading the Afternoon Tea stamp set. Check the end of my post to see how you can participate in a parade challenge! Today I created a little teabox to gift to a friend filled with lovely teabags! 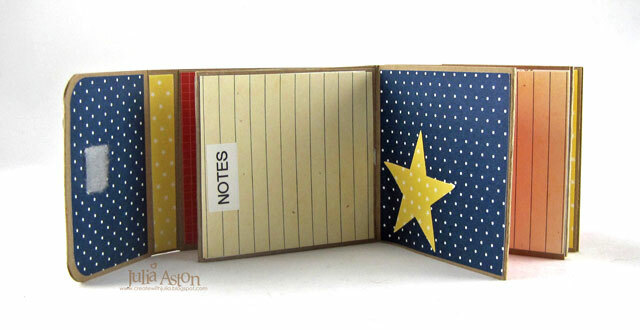 Our own DT member, Sarah Martina Parker, designed this box - I found her template here. 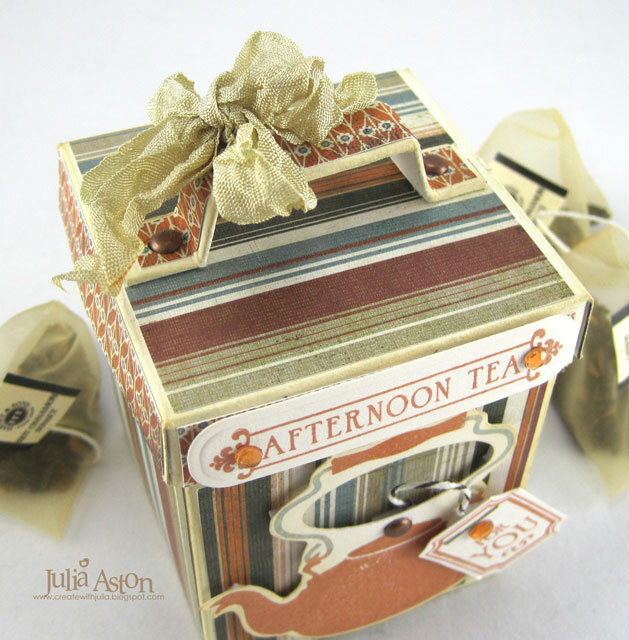 I thought it was the perfect size for gifting teabags (2 1/2" x 3") and the handle looked just like the old vintage metal canisters. After constructing the box and cover - I cut panels of patterned papers slightly smaller than the sides and adhered the papers to them - including the cover, the cover edges and the handle. After stamping the teapot - I cut it out and instead of trying to fussy cut the inside of the handles (which I DID try disasterously once!) - I punched it out with a small oval punch. The sentiment is cut with a Labels Trio die by Spellbinders. I stamped and hand cut the little teabag label, put a staple at the top like a real teabag (!) and attached a piece of black/white twine to the back. I adhered the label with foam tape and looped the twine behind the teapot, as if the teabag was already simmering in the pot! So there you go - I hope I've given you a little inspiration for using this wonderful Afternoon Tea stamp set! 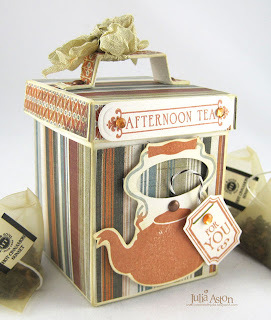 You can see all of my Afternoon Tea projects in my WMS gallery by clicking here. As our parade ends - we invite you to participate in a CASE (Copy and Share Everything) competition. Find a card or project from any of those posted during the SoAP by the WMS Design Team. CASE that project using Waltzingmouse Stamp images, post it on your blog or gallery and link it using the Inlinkz on Claire’s blog. The competiton will close at 8:00 AM Claire’s time (Ireland) on August 10th (3 AM Eastern, 2 AM Central and Midnight Pacific time). One project will be randomly selected to be highlighted with a Parade of its own on several of the Design Team blogs. The winner will be announced on Claire’s blog on August 11th. And now I hope you'll follow the parade one last time to see what the other Design Team members have created using this wonderful tea stamp set! Thank you SO much for joining us these past 4 days! Accessories: brass brads - Bazzill, wrinkled seam tape - Prairie Bird Boutique Etsy Shop, twine - PTI, Trio Labels - Spellbinders, rhinestones - Kaiser, small oval punch - SU, foam tape, stapler, Cropadile. Here we are at day #3 of the Waltzingmouse Stamp of Approval Parade (SoAP)!! 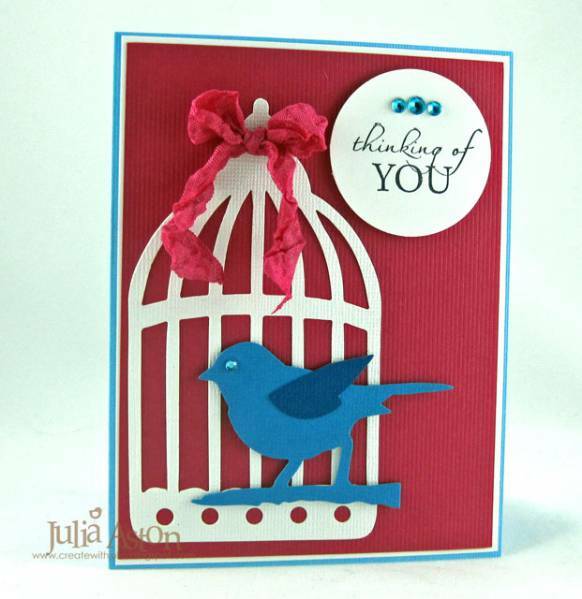 The Design Team is reviewing the WMS July release giving you more creative ideas on how to use the stamps you bought! Today I'm parading the the fabulous prom/wedding gown set - You're Lovely. 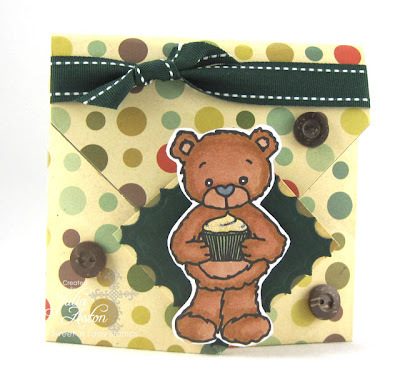 I found this fun 'hugs' card pattern by Dina Kowal over on Split Coast here. The felt flowers are cut with MFT flower dies, the leaves are Spellbinders Foliage. The sentiment is on a Spellbinders Fancy Tags 3. I adhered a rhinestone in the center of each flower. ﻿I outlined the gown with my Brick White Copic and added a few pearls to the waist. 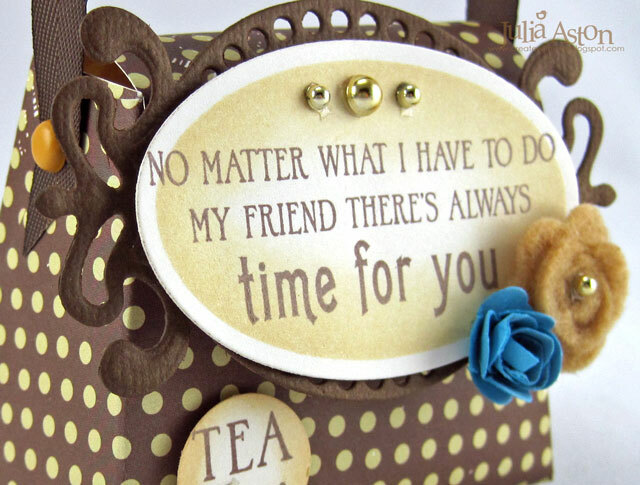 The sentiment is on a Fancy Tags by Spellbinders with the ends cut off so it would fit on the S (!) and I added a couple of rhinestones. Both the sentiment and gown are up on foam tape. 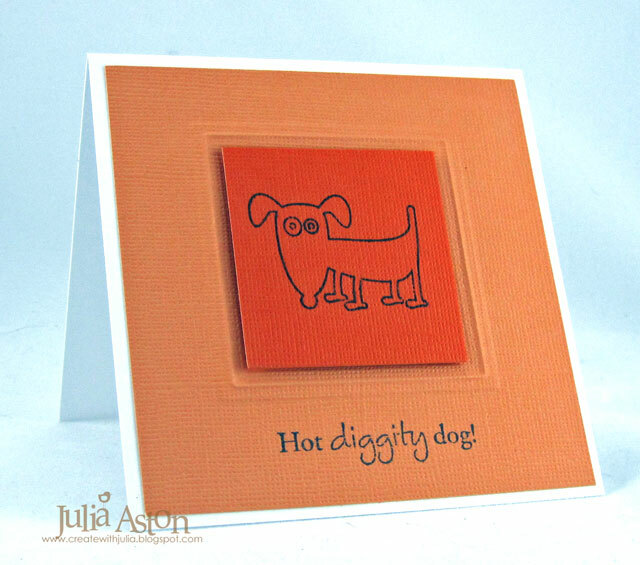 Isn't this a fun shaped card?!! If I had a daughter - I'd give her this card when she was getting married! 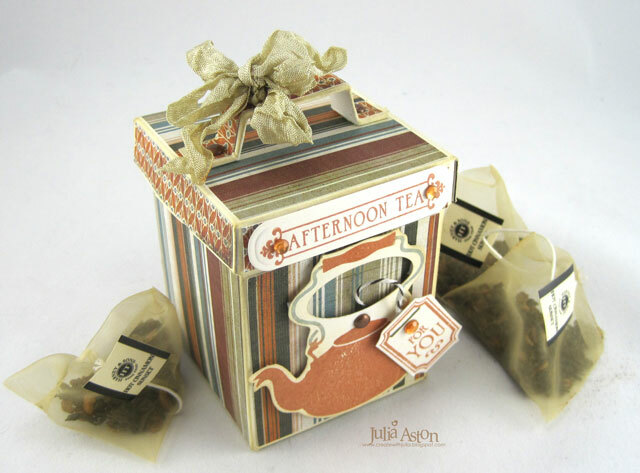 I hope you'll keep viewing the parade by visiting the other WMS Design Team linked below - and please stop by tomorrow for Day 4 where we'll all be parading on older WMS release - Afternoon Tea! Accessories: sticky pearls, white and green felt - Michaels, Foliage, Fancy Tags 3, Fancy Tags (with ends cut off) - Spellbinders, Copics - E40 Brick White, Scotch Quick Dry Adhesive, Hugs Template from SCS by Dina Kowal, Modern label punch - SU, foam tape, glue dots, flower dies - MFT, rhinestones - Kaiser, wrinkled seam tape - Prairie Bird Boutique Etsy Shop.